Can Ken Make It? : Tandy Color Computer BASIC games I published in my youth. This is the first program I ever published. It appeared in the September 1990 issue of The Rainbow, in the Novices' Niche section. You control a "harrier" like aircraft through a barrage of missiles. You need to maneuver left and right using the arrow keys, and guide your jet from the left and off the right side of the screen. Difficulty increases after 5 successful trips. You get a bonus jet after 10 successful trips. The original version in RAID.BAS for the Color Computer 1 and 2. I created new version (RAIDC3.BAS) for the Color Computer 3 that handles composite and RGB monitors, and uses the proper Color Computer 3 high speed poke. This appeared in the October 1992 issue of The Rainbow. It had the largest gestation period of any of these programs. Originally inspired by an exercise that came in the BASIC manual that had you navigate an asteroid belt on the low resolution screen. Taking inspiration from that and Surround and Tron Light Cycles, I worked on making a one player version of that. 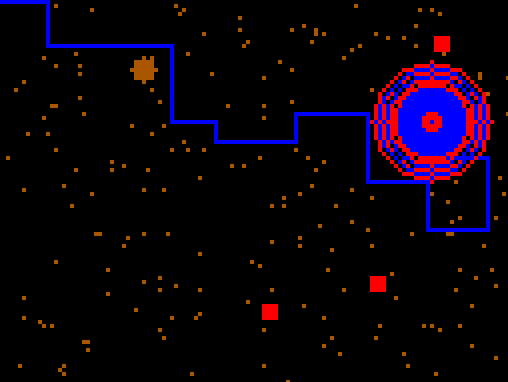 Once we got a Color Computer 3, I was able to change the palette of the PMODE 3 screen to make it look like outer space. You start in the upper left of the screen. You have use the arrow keys to avoid the asteroids and planetoids and collect the red trash bins. You also have to avoid the blue toxic waste trail your leaky ship leaves behind. Why outer space is 2 dimensional is a question that has never occurred to you. This Minesweeper knock off appeared in the November 1992 issue of The Rainbow. You need to clear all the non mine squares in the grid. Higher skill levels include more mines in a larger grid. Use the arrow keys to select a square. You can press the space bar to reveal contents of a square. If there are no mines adjacent to the square, it will be blank. If there are mines adjacent to the square, a number indicating the amount of adjacent mines will be displayed in the square. If it's a mine, you lose. You can use the ENTER key to mark a square that you think contains a mine. The game keeps the best times for each skill level on disk. This solitaire card game appeared in the January 1993 issue of The Rainbow. It was respired by a solitaire game from a PC at college that I somewhat remembered the rules of play. The object of Darn It is to move all the cards from the top portion of the screen to the play pile. Legal moves are chose in which the card to be played has a value exactly one higher or lower than the value of the face-up card at the top of the play pile. The suit of the cards is irrelevant. The card values go from Ace (low) to King (high). Use the left and right arrow keys to select a column and the up arrow to play the card from that column. When none of the bottom cards in the column can be played, turn the next card on the deck face up on the play pile with the down arrow key. The number of cards remaining in the deck is indicated on the back of the deck. When the deck i empty and no legal move are left, the game is over. You can go back in the game using the “OOPS” key (“O”) to undo moves. You can go all the way back to the beginning and try a new strategy. The version here is slightly revised with home help text and more rules options. When you start the game, it asks you monitor type, enable value wrap around, and enable the no play on king rule. Wrap around means you can place a ace on a king and vice versa. If the no play on king rule is enabled, you cannot play any card on a king and you must draw from the deck. This did not appear in The Rainbow but in the premier issue (August 1993) of The World of 68' Micros. It's a knock off of an old Atari 2600 game. You need to land the paratrooper on the target. Press the space bar to jump from the plane. Press the up arrow to open the parachute, then steer with the left and right arrows. Mind the wind. The later you open the chute, the more points you get. If you fail to open the chute you lose points. This wasn't published anywhere. I just found it on an old disk of mine that my brother found. Press a key to drop the bomb and hit the target. Mind the wind. You get 3 chances to hit each target. You get more points if you hit the target on earlier attempts. The original version in BOMBER.BAS for the Color Computer 1 and 2. I created new version (BOMBERC3.BAS) for the Color Computer 3 that handles composite and RGB monitors, and uses the proper Color Computer 3 high speed poke.